Amber Greeley is among 10 letter winners back for Shawnee this season. 2017 postseason: Defeated Elida 25-20, 25-23, 25-17; lost 25-17, 25-16, 25-16 to Shawnee in sectional finals. Returning letter winners: Kaleigh Ketcham (sr., 111 kills in 2017), Mallory Clark (jr., 88 blocks), Caitlyn Renner (sr., 391 assists), Kali Armstrong (sr., 345 digs, 24 aces), Riley Iiames (sr., 199 digs), Eden Adkins (jr., 102 kills), Paige Williams (sr.), Jasmine Blauvelt (sr.), Kennedi Sullivan (sr.). Top prospects: Jenna Tracy (soph. ), Bella Prices (soph.). Coach’s comments: We are looking to build on where we ended last year. We should defensively be able to compete with teams. We have worked really hard this summer to get stronger and quicker. I’m hoping their hard work pays off. They have great team chemistry, and the girls are willing to work hard to be a better team. We get better each day, and I’m looking forward to what they accomplish this season. 2017 postseason: Defeated Defiance 25-10, 26-24, 22-25, 25-18; defeated St. Marys 28-26, 26-24, 25-21; defeated Shawnee 26-24, 25-21, 25-23; lost 25-8, 24-26, 25-13, 25-11 in regional semifinals. Coach’s comments: This is a rebuilding year for us. We’ve lost 12 starters in the last two seasons so we’ve got some key positions to fill and some valuable experience to gain. We’re pretty scrappy defensively so our ability to keep the ball in play will make us competitive. We will need to control the ball as much as possible to be able to feed our biggest hitters in the middle and on the right side. Our outside hitters are coming along, but will need to work to get more consistent in order to be a bigger threat offensively. We’ve been enjoying the offseason getting to know our new team better and working out what each of the player’s roles will be for this fall. It should be another fun year. 2017 postseason: Lost 25-20, 25-23, 25-17 to Bath in sectional semifinals. Coach’s comments: We are going to be young agains this year, but we have some great upperclassmen that are ready to lead. They are starting to play together and are getting better every day. When we talk and me we play really well. I think if we put all of the little things together we are going to be competitive. 2017 postseason: Lost to Toledo Central Catholic 25-9, 25-6, 25-8 in sectional finals. 2017 postseason: Defeated Allen East 25-16, 25-5, 25-13; defeated Liberty-Benton 25-11, 25-14, 25-17l lost 25-23, 25-17, 25-21 to Coldwater in district finals. Coach’s comments: The young team will be working hard to define their roles on the team. Working hard to improve daily. They played at a high level this summer and look to continue to be very competitive this year. 2017 postseason: Defeated Bath 25-17, 25-16, 25-16; defeated Wapakoneta 25-18, 25-13, 25-17; lost 26-24, 25-21, 25-23 to Celina in district finals. Coach’s comments: We have very dedicated, hard workers on our team. That is going to lead us into success this season. 2017 postseason: Defeated Van Wert 27-29, 25-14, 25-22, 25-19; defeated Wauseon 27-25, 17-25, 25-22, 25-22; lost 28-26, 26-24, 25-21 to Celina in district semifinals. Coach’s comments: Just over a .500 record from last season, the Roughriders are coming back to improve their record. With the foundation set by a handful of previous varsity players, they have so far set a platform for the younger classmen to step into. Being my first year as Head Coach for the St. Marys Roughriders, the girls have transitioned extremely well with how things have been ran. We’ve been working on critiquing some fundamentals and bringing in some more position training. One of our key goals is to limit unforced errors. The girls have worked hard throughout preseason and i think they are just as ready as i am to get the season started. 2017 postseason: Lost 27-29, 25-14, 25-22, 25-19 to St. Marys in sectional semifinals. Coach’s comments: We lost four senior to graduation. We have six girls back that received a lot of court experience last season. I think that will help us to get a good start to the season. I believe we have a good group of players, and I think we are starting to get that hunger and passion to be a better team. We just have to continue to work on consistency in ball contro. We had a good summer of work and have shown a great attitude about working to be better. 2017 postseason: Defeated Bryan 25-20, 12-25, 25-20, 25-12; lost to Shawnee 25-18, 25-13, 25-17 in district semifinals. Coach’s comments: Wapakoneta volleyball is excited for the 2018 season. After losing six seniors to graduation, this group is eager to step up and fill those positions. There has been a lot of growth in each player, and the team is coming together and working hard. We hope to continue to improve and get better each day and believe we will be competitive each and every game. 2017 postseason: Defeated Temple Christian 25-11, 25-9, 25-8; defeated Pandora-Gilboa 25-27, 25-10, 25-19, 25-7; defeated Leipsic 14-25, 25-23, 19-25, 25-18, 15-10; defeated Lima Central Catholic 25-19, 25-15, 25-15; lost to Buckeye Central 24-26, 25-14, 25-16, 25-16 in regional semifinals. Coach’s comments: I’m very excited for this season. I have been coaching the seniors since they were in seventh grade so we have great team chemistry and a great group of student athletes. Our team will be successful this year if everyone is playing well and if we eliminate errors on our side of the court. We are focusing on our back row and defense and hope to beat teams defensively with losing the big hitters we had in the past. We have a new group of girls to the varsity level who are all dedicated and work extremely hard. It’s exciting to have a new group and starting fresh to force the ball to be moved around to all of our hitters. After the last three seasons of success and winning conference, the girls know that they have big shoes to fill but they are excited for the challenge and will always give full effort which is all I can ask as a coach. 2017 postseason: Defeated Van Buren 25-17, 25-21, 20-25, 25-19; lost to Ottawa-Glandorf 25-16, 25-5, 25-13 in sectional finals. Coach’s comments: We graduated six seniors last season, all were starters, if not important parts of the team. We pulled up a few younger athletes who will be a great addition to the team. We’ve had to learn to work together all over again, but I feel like the girls want to be successful, and they get along very well. 2017 postseason: Lost 25-8, 25-12, 25-6 to Coldwater in sectional semifinals. Coach’s comments: Taking over the program after some time of absence, we will look to develop skills to make us competitive. With a re-focus on aggressive offense and defense we will strive to limit our errors. We have some young players that will need to fill key roles in making this team competitive. Our focus on strategy and fundamentals will prove to be our strength as our lack of experience will need to be overcome. Coach’s comments: We have a strong returning team with potential to compete for league championships in PCL and NWC. We lost two all-state and three all-league seniors, but return a four-year letterman setter (Sybert) poised to set school career record for assists. Team chemistry has been good through summer and scrimmages. Upcoming players had a 20-2 JV season including going undefeated in both PCL and NWC. Coach’s comments: Expectations continue to be very competitive team throughout our strong schedule. Look to finish at the top of the NWC. Focus on consistency and not allow our opponent to run off continuous points. Each player understands their role, push one another to their limits, and continue to finish strong. Will have players in different positions this season and we need each of them to accept that role and do what is needed for the team. I’m seeing the offense and defense side of things getting better each day through practice and/or scrimmages. Girls are stepping up to the challenges and very eager to get the season going. They trust one another and know not just one player can carry them through. Very pleased with what I’ve seen so far with this group of girls. They are working very hard and know what it takes to be successful. Our defense has been battling and getting most balls up to our setter for the aggressive attack. We have big shoes to fill and maybe stepping into a new role, but I have confidence in this group of girls. They work well together, love competing and determined to achieve their set goals, but most importantly have fun doing it. Coach’s comments: We have a ton of potential, and the girls seem like they are really interested in learning. I am excited for this team, and I believe that great things can happen, once we put all of the pieces of the puzzle together. We have a great plan for strength and conditioning and hope that these girls learn something about nutrition that can help them in their future. My goals for this season are for everyone to remain positive (coaches, players, parents, support), to teach the girls more about volleyball and to have fun. Coach’s comments: I was the varsity coach at Paulding, from 1988-1999. The sport has changed somewhat, but this year’s team reminds me of my 1997 squad, who were NWC champs, going 10-0 that year. This team just gels together. There is great senior leadership. They have worked hard in the preseason, plus there is just a great deal of natural athleticism. We have some decent height, and I think we’ll be strong at the net, both hitting and blocking. Plus we are working hard on consistent serving. 2017 postseason: Lost to Coldwater 25-3, 25-2, 25-7 in sectional finals. Coach’s comments: The team is working hard to be better than last season. Each day players focus on one way they can improve their game. If the girls continue to work hard and give 100 percent effort, they will see success this season - individually and as a team. 2017 postseason: Lost to Lima Central Catholic 25-16, 26-24, 25-18 in sectional finals. Returning letter winners: Tara Gerding (sr.), Morgan Mock (sr.), MaClerin Morrissey (sr.), Camryn Hoffman (sr.), MaKenna Hoyt (sr.), Grace Klausing (soph.). Coach’s comments: I am very mcuh so looking forward to this season. This group of girls have worked so hard this summer and their want and drive to always learn and improve is what will help propel us this season. I have some veteran girls back and a few that missed last season due to injury and illness along with a couple of freshman girls who look to be a big help this year. Cannot wait to get the season started. 2017 postseason: Defeated Cory-Rawson 25-10, 25-9, 25-6; lost to Ada 14-25, 25-23, 19-25, 25-18, 15-10 in district semifinals. Coach’s comments: Strengths are nine returning letter winners including Blanchard Valley Conference Player of the Year Hayley Heitmeyer and second team all-league selection Carlee Siefker. Weakness and concern is consistency. Looking to fill the void of Kierra Meyer, lost to graduation. With nine returning letter winner from a 20 win team, Leipsc has the potential for a strong season. 2017 postseason: Lost to LCC 26-24, 27-25, 7-25, 26-24 in sectional semifinals. Coach’s comments: We have a lot of experience coming back. This group of girls play as a team, are versatile players, quick, and work hard. We have players playing in new positions and a new back row. We have a couple girls moving to positions they have never played before but they worked very hard in the offseason to become familiar with their new position. We graduated a four-year letter winner libero and a defensive specialist so back row will be new and inexperienced. We hope to be competitive in the league and to have a winning season. We hope to have a strong defense and aggressive hitting. 2017 postseason: Defeated Lincolnview 25-18, 25-14, 25-18; defeated Crestview 25-19, 25-18, 25-19; lost to New Bremen 25-19, 25-18, 25-15 in district semifinals. 2017 postseason: Defeated McComb 25-23, 17-25, 11-25, 25-20, 15-2; lost to Ada 25-27, 25-10, 25-19, 25-7 in sectional finals. Coach’s comments: We are a young team with only two seniors for the year. We are very quick and read the ball well, so the outlook looks promising as the year goes on. All in all I think P-G volleyball will surprise some people through the year. 2017 postseason: Defeated Bluffton 25-8, 25-12, 25-8; defeated Spencerville 25-3, 25-2, 25-7; defeated Minster 25-12, 25-11, 25-8; defeated Ottawa-Glandorf 25-23, 25-17, 25-21; defeated Pleasant 25-22, 25-14, 25-21; defeated Eastwood 25-20, 25-22, 25-14; defeated Independence 25-19, 25-21, 25-23; lost to Versailles 22-25, 25-20, 25-19, 21-25, 15-9. 2017 postseason: Lost to Crestview 21-25, 25-16, 16-25, 25-17, 17-15 in sectional semfinals. Coach’s comments: Roster’s very small with 14 total for both JV and varsity together. Only two returning returning starters and not a whole lot of varsity experience. I graduated four girls with four years of varsity experience in starting positions. My goal with these girls this season is to improve with each day and match and continue with a winning attitude and tradition. We are very young but excited to see how we progress throughout the season, playing in the toughest league in the state. We also play a very tough non-league schedule. These girls are excited, and I feel ready for the challenges and am wanting to work hard. 2017 postseason: Lost to Marion Local 15-25, 18-25, 25-22, 25-23, 15-7 in sectional finals. 2017 postseason: Defeated Wayne Trace 25-16, 25-16, 25-15; defeated Fort Recovery 25-16, 25-23, 9-25, 14-25, 15-8; lost to St. Henry 15-25, 18-25, 25-22, 25-23, 15-7 in district semifinals. Coach’s comments: We will have a great mix of upper and underclassmen on the court. I am very excited about the potential of the this group. We have a very tough schedule that will prepare us for our postseason play. 2017 postseason: Defeated Patrick Henry 25-20, 25-22, 25-15; defeated Perry 25-8, 25-16, 25-16; lost to Coldwater 25-12, 25-11, 25-8 in district semifinals. 2017 postseason: Defeated Parkway 25-18, 25-9, 25-20; defeated Ottoville 25-19, 25-18, 25-15; defeated St. Henry 25-19, 8-25, 25-21, 25-11; defeated Jackson Center 25-17, 25-14, 25-19; defated Fort Loramie 19-25, 25-20, 25-13, 25-17; defeated New Washington Buckeye Central 22-25, 25-16, 25-23, 25-18; defeated Louisville St. Thomas Aquinas 25-9, 25-18, 25-20 in state final. Coach’s comments: The MAC will be very solid again this year. The only thing harder than winning state, is doing it again. That is our goal. 2017 postseason: Defeated Delphos Jefferson 25-14, 25-14, 25-5; lost to St. Henry 25-11, 25-10, 25-15 in sectional finals. Coach’s comments: We are really looking forward to the 2018 season. We have five returning starters from last season and a talented freshman class joining the team. We are eager to start the season and have set specific goals we will be working towards throughout the next few months. 2017 postseason: Defeated Antwerp 25-18, 19-25, 25-11, 10-25, 15-11; lost to New Bremen 25-18, 25-8, 25-20 in sectional finals. Coach’s comments: We have only one senior on the roster this season so we will start out the season with a little bit of inexperience. Looking forward to seeing the new faces that come onto the varsity team this year and what they can bring to the table. Goals for the season are to get back to .500 or better, win two to three MAC games and a sectional championship. Playing in the MAC, every league night is a battle. I’m hoping to see us come into games ready to compete with anyone that we play and the confidence that we can make plays on our side of the net to push teams every night. It’s a fun group to coach so far, a lot of new varsity players but we want to keep expectations high, we know if we can compete with MAC teams we can compete with anyone in the state. 2017 postseason: Defeated New Knoxville 25-11, 25-10, 25-15; defeated Marion Local 15-25, 18-25, 25-22; lost to New Bremen 25-19, 18-25, 25-21, 25-11 in district finals. Coach’s comments: We are very excited about this season and the athletes that we have on this team. We have an experienced group of young ladies that have very high expectations. The MAC is once again going to be tough, but we are expecting to compete for a league title as well as make a tournament run. 2017 postseason: Defeated Old Fort 25-17, 22-25, 25-15, 25-17; lost to Carey 26-28, 25-14, 25-20 in sectional finals. Coach’s comments: It’s a rebuilding year. Five starters graduated. We are working on positions and team chemistry. 2017 postseason: Lost to Cory-Rawson 25-19, 27-25, 7-25, 26-24 in sectional semifinals. Coach’s comments: With only two returning starters, we are a very young team. We graduated seven seniors, including five starters, so we will be filling positions with athletes who have a limited varsity experience but great potential. We return senior MH Cassidy Craig and junior libero Hannah Hendrickson. These two should provide the leadership that the rest of the team will need. 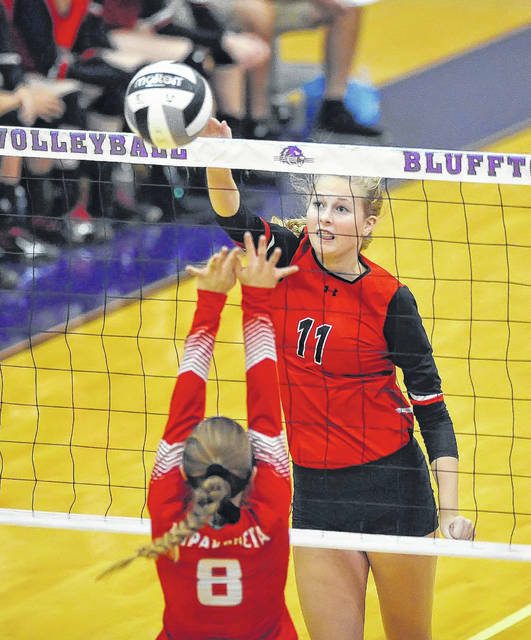 Barrington will fill the setter’s position after having limited varsity time last season as an outside hitter. Case also saw limited time last season, but is returning to familiar back row play. The remainder of the roster is filled with talent that will develop as the season progresses. These athletes are athletic, coachable and work well together, but will need time to grow into their roles at the varsity level. 2017 postseason: Lost 25-8, 25-16, 25-16 to Minster. Coach’s comments: Our team considts of four seniors, two juniors and four sophomores. We return six letter winners from last year’s team. Those six are a strong nucleus for our team this year. With the addition of our newcomers, continuing to work on our strengths, improving our weaknesses and how quickly we gel as a team will determine our success this season. 2017 postseason: Lost 25-9, 25-17, 25-18 to Arcadia in sectional semifinals. 2017 postseason: Lost 25-9, 25-10, 25-6 to Mohawk in sectional semifinals. 2017 postseason: Lost to Ada 25-11, 25-9, 25-8 in sectional semifinals. Coach’s comments: After graduating six seniors, Temple’s team for 2018 will consist of four experienced upperclassmen and five first-year varsity underclassmen. With inexperience in several positions, we hope to improve throughout the season and better last year’s record. 2017 postseason: Defeated Jefferson Township 25-1, 25-2, 25-3; defeated Emmanuel Christian 25-9, 25-18, 23-25, 25-22; defeated Cincinnati Christian 25-7, 25-11, 25-11; lost to New Bremen 25-17, 25-14, 25-19 in regional semifinals. 2017 postseason: Defeated Miller City 26-24, 27-25, 7-25, 26-24; defeated Continental 25-16, 26-24, 25-18; defeated Columbus Grove 25-20, 25-15, 25-19; lost to Ada 25-19, 25-15, 25-15 in district finals. Returning letter winners: Taylor Holbrook (sr., 133 digs), Victoria Lauck (jr., 406 digs), Jocelyn Morrisey (jr., 330 digs, 133 kills), Rosie Williams (jr., 128 kills, 60 blocks), Kassidy Meyer (jr., 228 digs). Coach’s comments: Solid group of returning letter winners but huge holes to fill. Players stepping into newer or larger roles will be key to success. 2017 postseason: Lost to Bowsher 25-21, 21-25, 24-26, 25-18, 15-9. Coach’s comments: I am excited for this season as we have returned seven varsity lettermen. The girls have worked hard all summer on the ‘small stuff’ to become a better, more cohesive team. We made a great addition to our coaching staff adding Sydney Mohler (LCC grad) as the assistant varsity coach helping mainly with our defensive players. We look forward to the challenges this season and hope for a couple more wins this season.